The movement against the plan to convert the Mandal-Bhecharji region into a special investment region (SIR) is fast acquiring a spontaneous character. 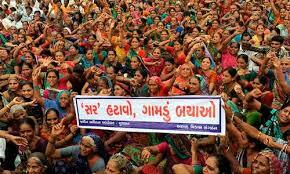 Even as leaders of the Jamin Adhikar Andolan Gujarat (JAAG), who spearheaded the movement against SIR a year ago, were busy working out a new strategy in Gandhinagar's Ambedkar Hall, nearly 10,000 women met in village Dalod to on Monday to protest against the proposed Mandal-Bechraji SIR. "They had done so on their own, right from the planning to the logistics management", said Persis Ginwall, a senior activist involved in the movement. JAAG leaders, who met in Gandhinagar, deliberated with those who have been protesting against land acquisition across the state. Those who participated in the meeting included activists involved in protest movements in Mahua against the Nirma cement plant, in Mithi Virdi against the proposed nuclear power plant, in Kutch against the power plants proposed to come up next to the Adani special economic zone and port, against the bypass proposed in Junagarh district connecting the national highway, and near the Narmada dam against the proposed plan to convert Kevadia colony into an entertainment zone. "The Gandhinagar meeting strangely took place amidst strict security on the part of the state government", a senior activist who went there reported, adding, "As against 200 activists who had come to deliberate on joint action at the Ambedkar Bhawan, as many as 1,000 cops were present. They frisked us each when we entered in. Why this kind of security was difficult to undertand. There was goig to be no mass protest or rally. The ostensible reason was the attack in Bodh Gaya in Bihar. When we protested, a majority of of th cops were removed." The women's rally in Dalod village took part with the participation of the affected villagers, mainly women, in the proposed SIR territory. They reached there on foot or in tractors, and shouted slogans like “jaan denge jameen nahin” (we will give up our lives but not our land), “gaamni jameen gaamni, nahin sarkarna baapni” (the land in the village belongs to the village, not to the government), “ek be tran char, SIR ne karo had paar” (one two three four, ban the entry of SIR), “janta jaage, SIR bhaage” (when the people rise, SIR will run away). "The children of village Dalod welcomed the women with beating of the drums and the youths showed their appreciation by making arrangements for lunch for the gathering", Ginwalla said.